Healthy Wave Petunia plants produce sweeping layers of vivid color all Summer long. Enjoy bountiful blooms on your Wave plants through the simple and easy grooming steps of pinching and deadheading. By performing these two techniques, you’ll enjoy the best-looking plants with the perfect form for display on your porch or patio, out-blooming the rest of the block. Petunias back encourages new growth and more branching, and in return, more blooms! On long stems that look “leggy,” pinch the stem back 1 to 2 in. (2.5 to 8 cm), making sure to cut back past the desired branch length (new growth will fill in that space). 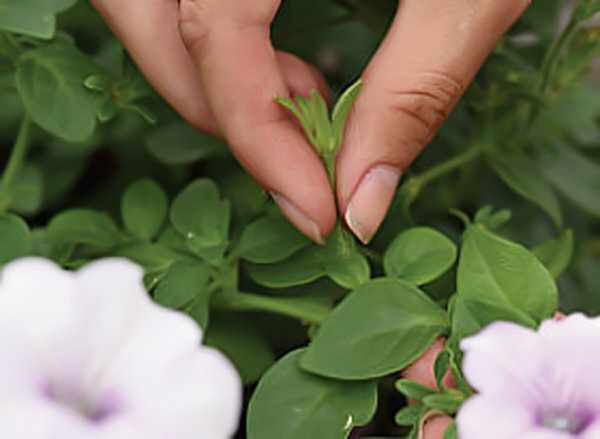 These growth tips will be tender and can be pinched using your forefinger and thumb, or a scissors if necessary. Once the branch is pinched back, new growth will begin to develop, creating the spreading form that Wave Petunias are known for. Wave Petunias will continue to hold their prized growth habit if they receive full sun (at least 5 to 6 hours per day), along with regular watering and fertilizer (once a week with liquid feed, or plant with slow release fertilizer). Petunias is another way to encourage more blooms on your plant. Although Wave plants naturally do not require deadheading due to their prolific blooming, the occasional deadheading will provide an even bigger boost to flower production. Once the flower begins to fade, remove it, along with the small stem that attaches it to the plant. Use the same method as pinching a plant back. Removing the flower before it sets seed will redirect the plant’s energy that would be spent on creating the seed, and will put it into producing more blooms. A healthy Wave Petunia is a happy Wave Petunia. Giving your Wave a trim will encourage this exceptional flowering plant to add delightful color and beauty to your porch or patio. Isn’t that what we are all after? More blooms and more color! Add these two simple grooming techniques to your Wave Petunia care regimen and see the difference for yourself.